Here are a few shots of some lovely blooms that I was able to salvage between rain showers (most have rain drops still on them). It started raining about two weeks ago and pretty much has not stopped. Luckily the roses seem to be loving all the extra water and most have stood up well to the torrential downpours. Take a look at whats blooming in our South Florida garden! I’ve wanted to build a rose bed in the front yard for a while now, but never had quite decided how to go about it as we have a large grassy patch in the front yard and digging it up wasn’t an option (according to my husband). He did however give me the idea of making a large round bed around a Royal Palm we have growing in the front yard. At first I was hesitant. The palm’s root system would interfere with the roses’ and would probably take all the nutrients etc. But then it occurred to me that I could build a deep raised bed with a retaining wall and keep the roses roots far above the ground level. This would have two advantages. Besides avoiding the palm roots, they could be planted in an excellent soil mix that was full of nutrients and much better than our sandy soil native to South Florida (even when mixed with conditioners and enhancers the sandy soil looses nutrients quickly). Secondly it would provide excellent drainage and great air circulation, as they would be a few feet off the ground. I immediately jumped at the idea. Memorial day weekend was coming and I knew I would spend it out working on my new rose bed. I already knew that the roses I wanted in that bed would be English Roses. 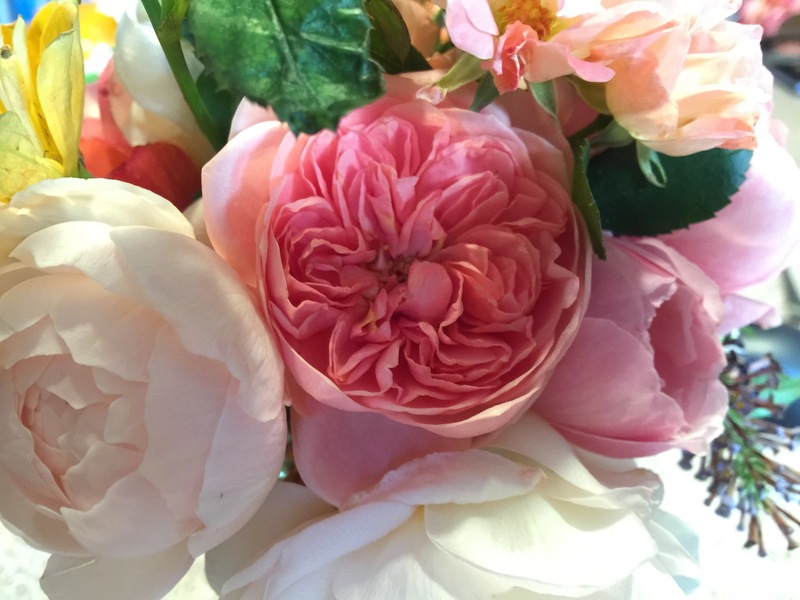 I have developed a passion for the plump old rose form slowly over the years and found that no rose brings me as much joy and happiness as the David Austin roses, and having had much luck with my Pat Austin, Claire Austin, Evelyn and Shepherdess bushes made me an even bigger fan. Austins are not usually found around here so I knew I would have to get them by mail order (and it would cost a fortune), so I figured I would have to create my rose bed over time. It’s not the best planting season for roses here either, as its already warm and too late in the season to start bare roots. I also wanted most of my roses to be on Fortuniana if possible, or on their own roots at the very least since Dr. Huey doesn’t fair to well down here and some of my roses have done quite well on their own roots. David Austins on fortuniana are very hard to come by and my only sources (K&M and Cool Roses) had pretty much sold out of every variety I was interested in, so it seemed like my rose bed would be very slow to get going if I wanted it all to be English Roses and I’m not that patient. I decided to stop by my local Lowes to check out what they had in stock. Lowes, has a funny way of getting rare roses in stock once in a while and they carry some of the Kordes roses that have the old fashioned form I’m fond of (Summer Romance, First Crush and the Fairy Tale collection come to mind). I figured I could make a mix of some of the DA’s I already had growing in pots and other roses I had easier access to, to make a mixed bed. To my shock and surprise, they had a huge collection of English Roses that had just arrived. I had never seen DA roses for sale in South Florida. Not even bare root. Ever! Many of these were mislabeled and it seemed to me like there may have been some sort of mix up, but I took the lot. They were extremely affordable and I didn’t have to pay shipping or wait until next season to get my rose bed. I was thrilled! To top it all off, the manager was kind enough to give me a discount since I purchased so many roses. Like my husband said to me when I got home: “Everything is coming up roses”. To my delight, most of them were on their own roots and many were correctly labeled. Others I was able to identify by bloom and even though some are still unidentified, I am certain they are all English Roses and I’m confident I will be able to ID them once they bloom. Alnwick Rose (multiple), Scepter D’Isle (multiple), Jubilee Celebration (at least one), Eglantyne (3 or 4), Huntington Rose (2), Charlotte (multiple), Winchester Cathedral (at least one) and Queen of Sweden (2). All are in the pastel color range, which is what I wanted and of the few that were unidentified one may be Carding Mill and one may be Crocus Rose. All of the Charlottes went in the back as that is the variety I had most of, then I interchanged between Scepter, Alnwick and Eglangyne leaving Huntington on the borders as it has a somewhat drooping habit and Queen Of Sweden clumped together (it has a tendency to be tall and thin) to form one larger looking bush. I still had space for a few more, so I planted my new Olivia Rose front and center along with my Boscobal and my Belle Story. I adore all three of these varieties and put them front and center facing my house to create a little excitement in the rose bed. I usually don’t have huge flushes like they do in the spring in cooler climates, but I hope to keep these roses clean and well fed in order to make the most of them. I’m extremely thankful to my hubby who helped me organize this rose bed and cannot wait to see all the lovely blooms. Below are some pics of the roses and the bed as its come to life. The bees and butterflies have already discovered the roses and seem to be as thrilled as I am. Many of these I have never grown, so I cannot comment on how they would perform here, and of the ones that I have grown, not all have done well. Some of the ones on my order this year are on this list, and some are not. And I’ve had great success other Austins in my garden, which are in fact not on this list. Florida is also a large state with many different climates. Some of the roses that grow well in Northern Florida, may not do as well down here, so it’s all a little subjective. Ambridge Rose: This rose is new to our garden this year, so it’s somewhat too soon to tell how it will perform. However so far it has done well and I expect it will continue to do so. Ours is grafted on Fortuniana. Carding Mill: I recently acquired a small band of Carding Mill on its own roots and it has bloomed three times for me already. Only time will tell how it truly performs, but so far it seems to be a profuse bloomer, albeit somewhat susceptible to black spot. Christopher Marlow: Just like Carding Mill, I got this one as a small band recently and it looks very promising as its already grown 4x the size of Carding Mill. However, it has yet to bloom, so time will tell how good of a bloomer it is. It’s been very disease resistant so far. Darcey Bussell: This is an excellent rose for South Florida performing admirably and blooming profusely. Ours was grown on Dr. Huey and pretty much bloomed continually for over three years before finally declining (a known problem with Dr. Huey is its short life span here). We recently replaced it with an own root version, which will hopefully live longer. This rose has good disease resistance and can even be grown in a no-spray garden. Heritage: A good all-around rose for South Florida. It can usually be found grafted on Fortuniana under the name Josephine Land (Nelson’s Roses). This is a good rose for beginners. We have one growing on its own roots and two on fortuniana and all have done well so far. Perhaps not blooming as much as we’d like, but being somewhat trouble free. Huntington Rose: An excellent variety that should be more widely grown. This rose was the one that really go us hooked on the Austins having performed very well even on Dr. Huey. We recently acquired one grafted on Fortuniana (from K&M Roses) and are anxiously waiting for it to get going. Jubilee Celebration: This is one of the most beautiful of the Austin roses and has a great bushy growth habit. We had one that did well on Dr. Huey, albeit it was short lived, and now we managed to get one from K&M on Fortuniana. It’s about to have its first flush in the garden! Jude The Obscure: Although this is on the list for Florida, it has never performed well for us down here. I’ve moved it from its somewhat poor location to a newer location. Although it seems happier in its new spot, it’s still a wimpy thing with only a few twigs. This is the second time we attempt to grow this rose and at the moment, would not recommend it for South Florida. Pat Austin: This is one of the best performing roses for Florida. Ours arrived as a tiny graft only about 1.5 feet tall with merely a few twigs and within a year has grown to a 4-foot tall bush that blooms admirably. This is definitely one to try in South Florida. We got ours grafted onto Fortuniana from Cool Roses in Palm Beach. Princess Alexandra Of Kent: For some reason our Princess Alexandra has never quite taken off. Although it’s still alive, it seems to be struggling and not exactly performing well. I’m surprised to see it on the list, but I’d be happy to give it another try if I could get it grafted on Fortuniana. Scepter’d Isle: We recently obtained this rose, and so far, it’s too soon to judge how it will perform. Ours is grafted onto Fortuniana and has bloomed a few times, but the flowers have been frail and lacking in petal count due to the heat. This is however not a well established bush yet, so we’ll need to give it time before we can recommend it. Tamora: This is in fact a good performer for South Florida, although ours is not quite in a good location receiving much too little sun. Ours is less than one year old so we’re hoping it will spring back soon. Even though its susceptible to black spot, and die back, we do recommend this rose for the novice gardener who would be willing to give it a little extra care. It’s a beautiful variety and has a small bushy habit that’s unusual for the Austins. The Alnwick Rose: This rose performed well for us, albeit it was very short lived when we originally had it (we’ve learned a lot about rose growing since then). We have one on order for this year on its own roots and hope to have better luck with it this time around. Wollerton Old Hall: This is definitely a good rose for South Florida, being one of the few that has lived for many years despite being grafted on Dr. Huey. It’s not our favorite bloom as it’s low on petals and shatters quickly, but there is no doubt it is a good performer for South Florida. Although it does suffer from black spot on occasion, it bounces back rather quickly and is recommended for South Florida. We currently have Windermere on order for February shipping, so we hope this one does well for us as it’s on the list for recommended varieties for Florida. To my surprise I did not see a few on this list that have actually done very well for me, so I thought I’d add a bit of info on the ones that were not on the list that I have had experience with. The Shepherdess: This rose has done amazingly and is one of the best performing roses in my entire garden. Even grafted onto Fortuniana, it keeps a nice, compact form and blooms profusely. We consider it a very highly recommended variety for South Florida. Evelyn: This is one of the most beautiful roses we’ve ever come across and it too does well in our South Florida garden. It has a tall lanky habit that’s somewhat un-appealing and perhaps that’s why its not on the list, but its still definitely worth growing and is a great bloomer. Ours is grown on Fortuniana. Claire Austin: Claire does wonderfully for me down here. Although her blooms are butter yellow as opposed to white, it’s still no reason to not grow this amazing rose that has great disease resistance and wonderful blooming power. Ours is growing in a large container on its own roots. Boscobel: This is one that looks promising as well. Although it may be a while before its available on Fortuniana (if ever) ours has grown well in a pot on Dr.Huey and has bloomed profusely. It’s good disease resistance and bloom-power, makes it a good rose for South Florida. You can read more about it here. Boscobel, a recent 2012 introduction by David Austin Roses has finally had a nice flush. After a difficult start, many of the Austin roses I ordered last season didnt fare too well. They were all purchased as bare roots and after they arrived, I potted them up quickly in large black nursery pots that I’ve kept from previous rose purchases. That year’s roses seemed dramatically smaller than ones I had received in previous years, but I potted them up anyway and they all took off rather splendidly. It was at this point however that I made the grave mistake of planting them in a new rose bed I had created in the side yard. The bed was made over an area that was once paved with large stepping stones. I expected there to be soil underneath, even if it was poor quality soil. Yet to my dismay when I lifted the pavers and dug, I was sorry to find nothing but sand as deep as the shovel would go. I dug almost three feet deep in some areas and never reached soil. So, I needed to not only amend the entire bed, but actually remove the sand and fill it in with store bought soil. To make a long story short, the Austins roses, which were all on grafted onto Dr. Huey, we’re not happy in the somewhat still sandy soil of the new rose bed. After a few months of decline I realized I would have to pull most of them out, or risk loosing them all. Many of my 9 roses did not survive the move. Lady Emma Hamilton died before I could even try moving her. Molineux was soon lost after the move. Belle Story survived the initial move, but later declined and died. Jubilee Celebration and Princess Alexandra Of Kent are still struggling after the move, and I’m not entirely sure they will make it. Gentle Hermione and Geoff Hamilton seemed to be doing ok in the ground so they were left in the bed and both are still doing ok, Hermione actually doing pretty well. Boscobel on the other has bounced back from the initial move nicely and is thriving in a pot on the patio. This says a lot about the new David Austin releases as they have recently been focusing on introducing stronger, more disease resistant roses and Boscobel is a good example of this. Not only did it bounce back quickly, but it produced an impressive little flush with rather large, full blooms for being such a small plant. The large round buds opened to reveal beautifully cupped rosettes packed with petals in a most unique shade of copper pink with deep salmon. Each one measuring about 2.5 inches. We sincerely hope this rose will be available on Fortuniana one day because this one seems like it will be a good performer in South Florida and David Austin Roses on Fortuniana are still hard to come by. Boscobal can be purchased online through David Austin Roses or Regan Nursery both on Dr. Huey rootstock.